Many years ago when I was newly married, living in Hawaii and poor (they do go hand in hand in most cases) I needed bathroom window curtains. Even the 'cheap' curtains were more than I wanted to spend. My husband was in the Navy and money for curtains wasn't in the budget. Hawaii was and is an expensive place to live. One day I received a surprise package from home that contained a beautiful set of towels. I knew I would probably seldom use them as they were too pretty, except maybe for company use. The person who sent me the towels asked how I liked them. I told a white lie and said they were perfect. They were perfect, inside the closet where they sat, they were perfect. One day when I really could not stand the naked bathroom window any longer I took out the pretty towels. I had a brainstorm. I don't sew, I can't sew well enough to make button stay on. The only way I knew to turn a towel into a bathroom curtain meant I had to sew. I thought that if I sewed it by hand and took my time that it would turn out ok. That was my plan until I told my neighbor my brainstorm and she said she could borrow a sewing machine and would be glad to sew for me. The bathroom window was small and I didn't want to cut the towels. I didn't care how long the curtains were as long as they did their job. So instead of trying to make the curtains fit the window we just improvised and let them hang much lower than the actual window. Since a towel has finished edges on all four sides all we did was fold the top toward the back of the curtain about 2 inches and she sewed it down, which created a pocket for the rod to slip through. There was already a very basic curtain rod at the window. All I had to do was slide the curtains onto the rod and bingo - almost instant curtains. We were quite pleased with the finished product. When my husband came home I went into great detail about the design of the new bathroom window curtains. Then I showed him the towel window curtains and he thought they looked very good. My neighbor was so pleased that she made bathroom curtains out of towels for herself. There are several good reasons to make bathroom curtains out of towels. They come in a large variety of colors, patterns, sizes and prices. It requires very little sewing to turn towels into curtains. They are easy to wash, no ironing or special care is required. When you get tired of them as curtains you can take out the stitches and turn them back into towels. If you really don't want to sew you can buy the ring clips. 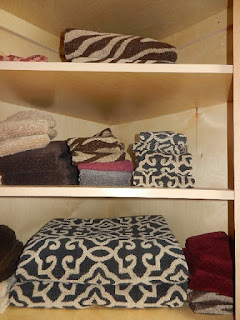 Just clip the rings onto the top of the towels and hang that way, no sewing required at all. You can hang them on a café style rod or other decorative rod since the rod will show. Towel curtains would work well in a laundry room, or even a child's room. Kitchen window curtains or just valences could be made from fancy dish towels. Towel curtains would be very appropriate for a beach house. You could use beach towels for a longer look. Beach towels have such bright bold colors they can do a lot to dress up your space. Maybe you have your basement or rec room decorated with palm trees and a beach theme; you could use some beach towel curtains to complete the look. If you need window curtains, use your imagination and some towels and you will wind up with designer curtains at budget prices!